Following the harvest period, Bollinger's decisions on blending are not made before January. The blend for the Special Cuvee is an ideal version of the classic Champagne blend, using the different grapes of a given year from a variety of crus, with the addition of older, reserve wines. This blend necessarily incorporates subtle variations each year whilst remaining consistent to a style. It is, therefore, the hardest of all Bollinger to make. It contains the full expression of the Bollinger style and the House feels it should be judged on this - its benchmark wine. The denomination Special Cuvee was created in 1911. The idea came from William Folks, then partner of the illustrious London House of Mentzendorff. This great wine lover felt it was an insult to simply call this great wine "non vintage". The suggestion of naming it "Special Cuvee" was immediately approved by Monsieur Bollinger. A blend par excellence, the Special Cuvee is the purest expression of the Bollinger style; of its craftsmanship and its singular conception of what a champagne should be. It is, therefore, on this wine that the House of Bollinger shows how it is different from other Champagne Houses, asserts its qualitative policy and by which it asks to be judged. Madame Bollinger - "I drink it when I'm happy and when I'm sad. Sometimes I drink it when I'm alone. When I have company I consider it obligatory. I trifle with it if I'm not hungry and drink it when I am. Otherwise I never touch it - unless I'm thirsty." "Cool, delicate briochey nose. Nice, rich fruit with honeyed undertones, reserve wine richness and texture. Complex, classy." Anthony Rose Decanter Magazine, 1 January 2008. If you want to enjoy a good bottle of Champagne you often think of expense. 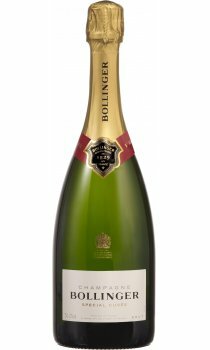 Bollinger is different it retails at a fair and affordable price but still offers the great tastes we can expect to find from other Champagnes'. I found Bollinger quite dry at first (Brut) but finishes well on the tongue. The second glass is different to the first, and the end of the bottle is as enjoyable as the beginning. A delicious champagne at an affordable price, well worth buying and enjoying.